Last time we discussed how much fluid you need to stay hydrated, now let’s customize it for the grams of carbohydrate. Carbohydrates are the energy in sports drinks that keep your brain focused and muscles fueled. According to the American College of Sports Medicine (ACSM) and the American Dietetic Association (ADA), 30-60 grams of carbohydrate are recommended per hour to maintain blood sugar levels. This is the average range for athletes. If you really want to dial in your carbohydrate needs, the rule is 0.7 grams of carbohydrate/kg of body weight per hour. Example: Bob weighs 165 pounds. Bob should consume 52 grams of carbohydrate/hour based on his weight. 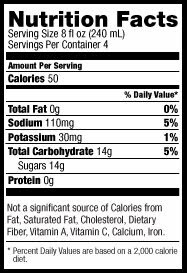 The Gatorade nutrition facts panel on the left tells us that this sports drink contains 14 grams of carbohydrate/8 oz serving. In order for Bob to get 52 grams of carbohydrate/hour he would need to drink 3.75 cups of Gatorade. 52 grams/14 grams of carbohydrate per 8 oz = 3.75 cups. Further research tells us that your stomach will empty, and absorption is fastest when beverages contain 6-8% carbohydrate. The Gatorade nutrition facts panel on the left tells us that Gatorade contains 14 grams of carbohydrate in every 240 ml (8-oz) serving. So, 14/240 x 100 = 6% carbohydrate. There are many excellent sports beverage choices out on the market. You can perform these same calculations on your selection to determine how much you need to drink/hour and if it makes the 6-8% grade. In the last post, we determined that I needed to consume 5-6.25 cups of fluid to complete my 25K running an 8:15 minute pace to maintain my hydration needs. Now let’s individualize that to meet my energy, carbohydrate needs as well. If I weigh 122# / 2.2 = 55.45 kg x 0.7 = 39 grams carbohydrate/hour. I need to drink 2.75 cups of Gatorade/hour to meet my energy needs. My race will be completed by 2 hours, 15 minutes. 2.75 cups x 2.25 hours = 6.2 cups Gatorade. Hey, Gatorade will work for me, but I better drink on the higher end of the range if I want to meet both my fluid and energy needs combined. If this math leaves you a little bleary eyed, contact me through my website http://www.e2dietitian.com/ and we can test your sports beverage and dial your needs as well! ‹ Should I Drink at Every Aide Station?